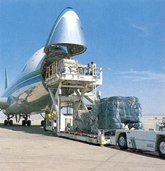 The demand for cargo continued to grow last month with international scheduled freight traffic showed a 26.5 percent improvement over the same month last year, according to figures released by the International Air Transport Association (IATA). But the growth was down from the 34 percent recorded in May, which was exceptionally high as some interrupted traffic from April�s ash crisis shifted to May. Volumes remain six percent above the pre-recession peak in early 2008. Freight demand continues to follow economic recovery and trade patterns with airlines in Asia-Pacific (+29.8 percent), Middle East (+39.6 percent), Latin America (+44.9 percent) and Africa (+54 percent) growing the fastest. Carriers in North America (+24.2 percent) occupy the middle ground. Europe (15.3 percent) is growing at half the rate of the fastest growing regions based on slower economic growth. This trend is particularly evident in Europe, which is the only region still five to six percent below the pre-recession peak. The low value of the euro will be a help to the region�s exporters and eventually drive up freight volumes.